This stunning collection brings together ornate floral motifs and mixes it with vintage glamour to produce this ultra femine set of item designs. This series of jewellery items will never fail to please. A mix of burnished 12K gold plate with Swarovski crystals, pearls and faceted beads in muted shades of peach, cream and light Topaz browns. Ornate necklace. Flowers measure from 1.5cm/15mm upto 3.5cm/35mm. Adjustable length 40.5cm/16 inches upto 48cm/19 inches. 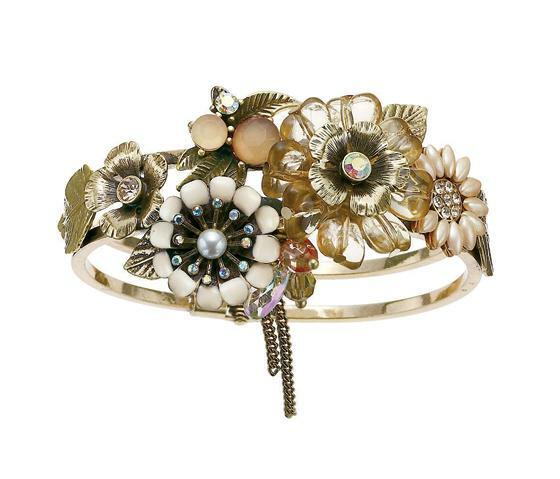 Stunning corsage hinged bangle. Widest part measures 4cm/40mm. Featuring a beautiful collection of flowers. Smallest motif 1.5cm/15mm largest flower 3cm/30mm. Inner diameter 6.5cm/65mm. 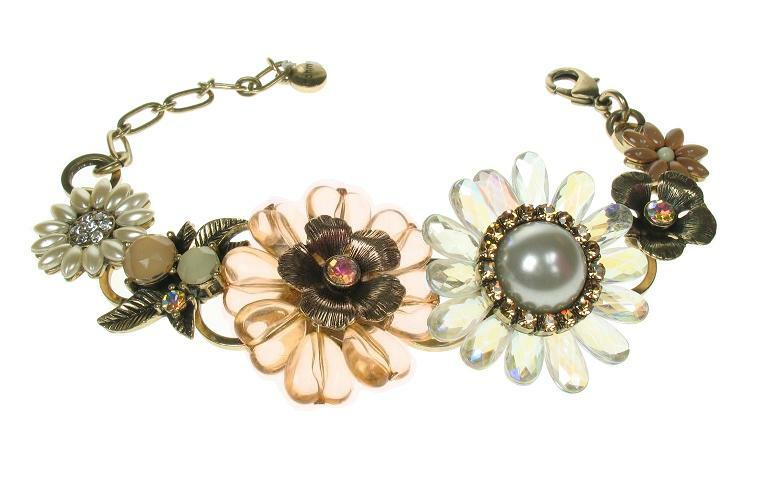 Stunning corsage bracelet. Featuring a beautiful selection of flowers. Smallest motif 1.4cm/14mm largest 3.5cm/35mm. Adjustable length 18cm/7 inches to 23cm/9 inches. Pretty cream enamelled double flower earrings with clear AB Swarovski crystal stamens and a cream pearl centre. Flower measures 2cm/20mm. Stud style for pierced ears. Pretty cream pearl petal flower earrings with Swarovski crystal studded centre. Flower measures 1.8cm/18mm. Stud style for pierced ears. Stunning focal ring. Adjustable band (5mm wide). Pretty cream enamelled double flower with clear AB Swarovski crystal stamens and a cream pearl centre. Outer row of claw-set matt finished smoked Topaz crystals. Flower measures 3.5cm/35mm.